If you’re looking for something fun to do with the kids, look no further. We have everything you need in this list of 73 fun apple crafts and apple themed activities for kids. If you’re looking for some apple themed art for preschool-aged kids or maybe some apple crafts for preschool, we can help you with that. When the kids are cooped up indoors on a rainy day you can choose some of the apple themed games we have on the list. We will even help you spruce up your classroom for the holidays with some apple bulletin board ideas, and if you want to teach the kids about popular apple varieties, we have that too. No matter if it’s Halloween, Thanksgiving, or Christmas, apples are a great way to entertain and decorate. Of course, when the fun is over, the best part is enjoying a delicious apple snack. Some things that will make noise inside the apple shape such as buttons, seeds, rice, dried beans, small pebbles, etc. Have kids paint two pieces of apple shaped poster board or paper plates. Glue and staple the two pieces together with the sound-maker in the middle inside of it. Using an apple corer, make a hole about halfway through the middle of an apple. Make the hole as straight as possible and remove the core piece. Insert a candle into the hole. It should fit tightly; if the hole is too large, wrap the waxed paper around the candle’s end. Older kids can decorate the apples by carefully carving designs in the skins with the tip of a potato peeler (to prevent the designs from turning brown, rub them with lemon juice). Arrange the candleholders in a circle on a plate or cutting board. Make sure that the apples are stable. Cut the bottom accordingly if not. Place lemon juice in a large bowl and stir in salt. Peel, core, and slice apples horizontally into 1/4″ thick circles. Soak slices in lemon juice bowl for approximately 6-10 minutes, making sure each side of the slices has a chance to absorb some of the lemon juice. While waiting, mix spices in a bowl and blend well. Remove the slices from the bowl and place them on paper towels. Pat tops of apple slices with paper towels. Dust apple slices with spice mixture. Turn slices over and repeat on opposite side. Place apple slices in a single layer on a baking sheet. Bake at 150-200 degrees F for 6 hours or until completely dried. Apple slices should be slightly pliable. Combine the lemon juice and salt in a bowl and soak the apples for 20-25 minutes. 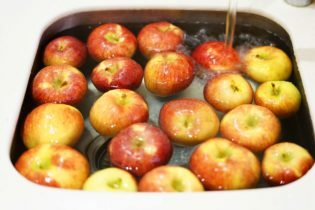 Turn apples once while soaking. Coat a baking sheet with the non-stick cooking spray and place the apple slices on the sheet in a single layer. Bake for 4 to 6 hours until the slice feels leathery but not brown. Turn slices over once during baking. Fold each apple slice in half, and then into quarters and thread the apple slices onto the wire. Continue to pack on the folded apples until the wire is completely filled. When the wire is completely covered, use pliers to bend ends into hooks so that they can connect and close. Carefully shape wire into the desired shape. The recommendation is either a circle or heart shape. Using the ribbon or fabric scraps, create a hanger for your wreath. Hang on the wall, or package as a gift for someone special. Large, firm apples. The apples shrink a lot when they dry so you want to be sure that they are big enough, to begin with. Firm apples will be easier to carve and will dry out much better. Peel the apples. You can core them if you would like, although it is not necessary. brush a mixture of lemon juice and salt onto the peeled apple. The lemon juice and salt mixture will help keep the apples from turning brown as they dry. Carve out the basic features of a face from one side of the apple. Don’t go into too much detail since when the apple dries any small details will be lost. Focus on creating large features like the eye sockets, a nose, and a mouth. Place the carved apples somewhere dry and out of the way. Turn them every couple of days and in about 2 weeks they will have shriveled up into ghoulish little faces. You can speed up the drying time if you would like by setting them on a cookie sheet in the oven on the lowest setting or by using a food dehydrator, although it will still take some time for them to dry and shrivel. Make a body by putting the heads on small bottles (shampoo, dish soap etc.) Make a dress out of a piece of fabric. You can even use a small paper clip to make glasses. Tip: To make a shrunken apple for a witch’s head you would most likely carve a large nose, two deep holes for the eye sockets and a sneering hole for the mouth. Keep the shapes that you carve simple and larger than you think you need them to be since they will shrink as they dry. Slice apples sideways and place the slices in a lemon juice and water mixture for a few minutes. Moisten rigatoni pasta with water and then roll and coat them in cinnamon. Using plastic needles and yarn, alternately string the apples and noodles. Add a country fabric bow (or your choice of the bow) to the top and dry near a sunny window. The wreaths hang straight down and look and smell great! Arrange four craft sticks to form a small, rectangular frame the size of a school picture. Using a school picture as a guide, lay one stick across the top and a second across the bottom. Place once craft stick vertically at each of the picture edges to frame the picture. Glue the sticks and a picture in place. Glue two or three dried apple slices to one corner of the frame and a magnet to the back. Draw a very large apple (made from card-stock if possible). Laminate it and cut into pieces to put back together like a puzzle. Save pieces in a plastic baggie. Place the dough or clay at the bottom of the can. Stand the twig in the center of the clay. Twist the tissue squares to resemble bow ties. Glue the bow ties to the branches to look like leaves. Glue a few of the red beads on the branches to resemble apples. Have kids decorate the paper strip; cover the can and glue it in place. Cut out a small finger hole somewhere on the apple. Children hold up the apple with one hand while they stick their pointer finger from the opposite hand into the wormhole and wiggle. Stick your finger (worm) through the cup and you have a fun worm puppet. Leaving the hole open to hold the pencils, put papier Mache around a toilet paper roll. Insert a brown or black pipe cleaner stem. Use green raffia, construction paper or foam sheet for a leaf. Have an adult use a sharp knife to cut a slit across the lower half of the ball for the mouth and to poke a small slit in the top of the ball for the stem. If you have a shop vise, you can use it to hold the ball steady while you make the cuts. The deeper the mouth cut, the easier it will be to squeeze the mouth to open it. Paint the ball red. Let it dry on the plastic-foam egg carton. Stick a piece of masking tape on the back of each wiggle eye to create a better gluing surface. Glue the eyes on the ball above the mouth. Glue on the red pom-pom for the nose. Cut a 2-inch piece of brown pipe cleaner for the stem. Push the end of the stem through the hole in the top of the apple. Cut a leaf shape from the green felt scrap. Cut a tiny slit at the base of the leaf. Slide the leaf down over the stem through the slit so that it sits on the top of the apple. Use the black marker to make a line over the cut of the mouth to accentuate it. To make the mouth of the apple open and close, squeeze the ball on each side of the mouth. This little apple puppet can pick things up with the mouth and swallow them. You might want to make a game of seeing how many things the puppet can pick up and swallow in a set amount of time. Try picking up peppercorns, small pom-poms, or popcorn kernels. One person said the children were more interested in throwing than picking up, but they did pick up bits of cereal and raisins. The kids especially liked to play the “apple eats your nose game”. More than one group reported apple puppets nibbling at other kids with much giggling, a part of the game. Cut an apple for each child to glue a photo of themselves on and put on the bulletin board. Draw a large basket with apples in it and write each child’s name on an apple. Apples on a tree with each child’s name on an apple. Post the above poem and then draw a huge apple core with everyone’s names on it. 17. The New Crop is in! Place children’s photos or names in apples and hang on the tree. Glue and cover the plate with the pieces. Add a green paper stem and hang up on. Cut out a tree-shape trunk from the brown paper; cut out apples from the red construction paper. Assemble and glue the trunk and apples on a background piece of paper. Cut out many small, thin (about 1/4-inch-wide and a few inches long) strips of green paper and some red strips as well. One by one take the strips and wrap them tightly around a pencil and they will curl. Remove the curled paper from the pencil and dip the edges in glue. Add each glue edged curl to your tree. Keep repeating this process until the tree is covered with apples and leaves. Put paper in a shallow box. Dip your apple in the chosen paint color and use a spoon to scoop it out and onto the paper. Now hold the box tilting it back and forth as the crabapple moves across. When there is no more paint, dip the crab apple again or put a new apple into a different color. Cut the apple in half. Experiment with the apples by cutting them in different ways. Cut through the top and out the bottom to make a traditional apple print, cut through the middle to make apple star prints. Cut the apple into quarters for a different print also! Fold a paper towel into 4ths and lay it on the bottom of the Styrofoam plate, etc. Pour paint into the center of the paper towel to make it into a stamp pad. Using red, green, and yellow paint will represent the different kinds of apples. Dip the cut side of the apple into the paint. Dab it around on the paper towel to wipe off excess paint, and then press it onto the paper. To finish off, cut sponges into leaf shapes and have kids repeat the above process to paint leaves. When dry add stems and seeds with sharpies. Tip: Make a whole collection of apple pictures this way. You can also use fabric paint and make an apple print T-shirt, towels, etc. Dip pieces of yarn into paint and drag it across the paper to make squiggles, lines, etc. Tip: You can also use cooked noodles for worms. Dip newspaper strips in a mixture of your favorite papier Mache recipe. Completely cover the balloon. Let it dry thoroughly. Paint and decorate the shape to look like an apple. Make an apple tree mural. As fall progresses, add pumpkins, scarecrows, etc. to the mural. As Thanksgiving arrives, add a turkey, cornucopia, pilgrims, Indians, etc. Paint a still life of apples by putting together a bowl of apples, or apples on a table. Put out the paints and paper and see how creative the kids can be. Add the cinnamon to the applesauce until you get a clay-like consistency. You may add glue for added thickness. Once the dough is mixed, create shapes with your hands or roll the dough out and use cookie cutters. Let the dough dry. Store unused dough in a bowl with plastic wrap as a cover. Mix until the consistency of cookie dough. (Add more water if needed.) Sprinkle cinnamon on the cutting board and knead the dough. Roll out 1/4-inch thick. Cut into shapes using cookie cutters or Popsicle sticks. Punch a hole in the top with a straw or pencil before drying (so you can string ribbon through later for hanging). Bake in 350° oven for 30 minutes or until firm. Let them cool, and then decorate! These are usually used as ornaments—–but make necklaces from them. Mix the applesauce and the cinnamon until it gets to a nice clay consistency. If it’s too sticky, add a bit more cinnamon or even a touch of flour. You can make shapes and designs or use cookie cutters. Put the shapes in a warm, dry spot to dry, this takes a few days. You now have sweet-smelling sculptures to decorate and/or paint. Use red, yellow, and green colored play dough, adding cinnamon spice to it. Lay out the apple cookie cutters and tools. Kids may want to make their own version of an apple (or other things) Add a pipe cleaner for a worm. 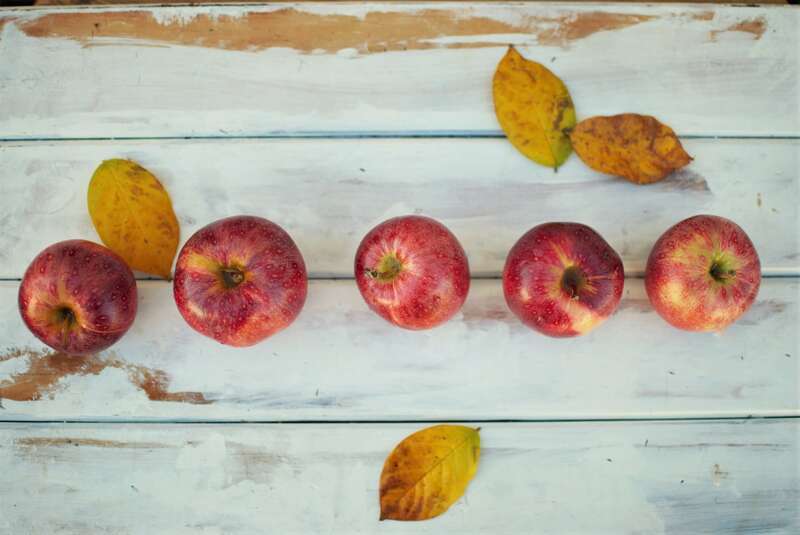 Cut a large number of apples and write a different instruction on each apple for a relay race such as skip, crawl, crab walk, hop, walk backward, etc. Put the cut-out apple shapes at the end of the room in a pile for each team. Return the apples to the bottom of the pile until all have had a turn. Tip: Laminate the apples for future fall, harvest or apple themed days. In advance, cut each apple shape into two pieces with bold, unusual lines, so each one is unique. Distribute one-half of an apple to each child. At a signal have the children find the other half of their apple. Much like Bobbing for Apples except trying to get the apple while it is hanging from a line! Hang a string between trees or use a clothesline. Tie some more string to apple stems and hang the apples from the clothesline. Kids then attempt to grab an apple by using their teeth, no hands! Prepare a large apple shape from construction paper before the game. Put the children in a circle and play fun music while they pass around the paper apple. The person holding the apple when the music stops wins a treat. Before you play make half as many 24-inch apples as there are children in the group. Tape the apples to the floor in a large circle. Play music and have the children walk around the circle of apples. Stop the music intermittently. When the music stops, have each child stand on an apple with both feet. More than one child can share an apple; children may hang on to one another in order to stay on their apple. Do not eliminate payers instead eliminate apples! While children are walking, remove one apple. Eliminate an apple each round until it is impossible for children to use any fewer apples. Before play cut a medium to large paper apple. Provide each player with 4 plastic disks (Tidily Winks, poker chips or Bingo markers). Form a circle at a table or on the floor. Place the apple in the center of the circle. When you say “Go” the players “shoot” their disks onto the apple by pressing the edges with another disk. How many can they get to land on the apple? It’s harder than you think! Let the kids try this as many times as they would like. If you have a large group of children, divide players into smaller groups and make more apple “targets”. Cooking something with apples? Kids will like the challenge and the bonus of their efforts…a yummy apple something! Using the peeler (kids) or knife (adults only), see who can produce the longest unbroken strip of apple skin. For an added challenge, see who can produce one that is both the narrowest and the longest. Divide kids into equal teams. Have them sit on the floor close together and in a straight line. Ask kids to put their hands on their shoulders (right hand on right shoulder, left on left shoulder). Place an apple between the elbows of the first player on each team. At a signal, have players pass the apple down the line from person to person. When the apple reaches the end, reverse the direction and have the kids pass the apple back to the starting point. On the word “go,” a team member places an apple on the back or hand of the first player. The first player races to the end of the course and back without letting the apple fall off their back or hand. If the apple falls off, that player must stop where he/she is and put it back on. Once the apple is back in place, they keep going from where it fell off. When the player gets back to their team, they put the apple on the back or hand of the next person in line. Stand with feet together, bend, and touch hands to the floor, just in front of your feet. Walk your hands forward, without moving your feet up, until you can’t go any farther. Next, walk your feet up to your hands. If some of the children cannot do this, they could always lie down on the floor and wiggle forward any way they can. Play some music to go with the movement!! First, place markers at the end of the course, about 40 feet away from the starting line. On the word “go,” a team member places an apple on their head. The first player races to the end of the course and back without letting the apple fall off their head. If the apple falls off, that player must stop where they are and put it back on. When the player gets back to their team, they put the apple on the head of the next person in line. The first team to finish wins. Players hold their hands behind their back and grab apples with their mouth and run to the finish line with the apple in their mouth. This can be played with several bowls of apples where everyone races at the same time or it can be done one at a time and timed. You will need a bushel basket and five apples you can substitute red bean bags or small red balls. Use masking tape to tape a line on the floor. Place the basket five to six feet away from the line. Have the child stand behind the line and try to toss the apples into the basket. The players must try and get an apple out of the bin by biting into it. He may not bite the stem and he may not use his hands in any way. Also, smaller apples work better for younger children. Put the apples in the bucket with the water. Do not totally fill the container, you want the apples bobbing around. Select the first two or three players and have them put their hands behind their backs. Say, “Go,” and have players try to grab an apple with their teeth, all at the same time. The first to bring an apple up wins. Provide towels for all players. Even losers will be wet. Provide 1 balloon per player that is not inflated. On red, yellow or apple-green butcher paper, draw a large apple shape (or the apple can be colored in by the group). Put a tape mark in the center of the apple to represent the target! Score 5 points for the closest balloon and 15 points for a direct hit. This game works well with teams – each team gets their own colored balloons; red, blue, green etc. You do not need to keep score at all and just have fun playing the game several times. Have children cover their eyes (no-peeking) while an apple is hiding in the room; hide the apple where the children will be able to find it with little difficulty once they start looking. Instruct the children to find the Apple, but not to touch it when they see it. As each child discovers the apple-they sit back down in their spot. They stay seated until the last child has ‘found’ the apple. The first one to sit down gets to hide the apple for the next game. Good if you only have a few kids. Play the game the same as Apple Hide and Seek, however, tell children individually whether they are “hot” or “cold” in relation to the apple. Allow the children to have a turn in hiding the apple–and if their friends/siblings are hot or cold. Tip: Prior to starting the game–be sure to explain the meaning of ‘hot and cold’. Play this game like “Hot Potato” using an apple! Compete by pushing an apple to the finish line with your nose. Have the children place an apple under their chin and run to the opposite side of the room/play zone then place it in a basket. The first team to fill the basket wins. Take an apple and cut it in half. Put peanut butter and bird seed on it. Place or hang it from trees and watch the birds. Discuss the growth of an apple tree from seed to tree— to apple and back. Show the apple and have the kids guess the number of seeds in it. Cut open the apple and find out how many there really are. Have children taste them and see which one they like the best. With older kids, you can chart and tally the results. You can also do this with applesauce (flavored vs. unflavored and also taste test cider vs. apple juice. Make a chart by putting a picture of three different colored apples at the top. Have each child’s name written down the left-hand margin. Tally up the results and make a total at the bottom of each column. You can get the colored sticker labels from the stationery store for the children to use to put on the chart. If they like a red apple, they place their red circle sticker under the red, yellow circle sticker under the yellow apple, etc. They enjoy doing this because they get to use stickers—but they also get to taste a variety of apples! Set a red, a yellow, and a green apple on the table. Ask children to name the colors. Cut the apples open and talk about how they have different colors on the outside, but are the same on the inside, just like people. Tell youth you will be spending some time finding out about how people are the same and how they are different. Put the apples on a table in front of the group. Have each student choose an apple. Tell kids to get to know their apple really well. Suggest they notice their apple’s special characteristics. Have them make up a story about their apple and tell it to a friend (modeling this step is helpful with younger students). Allow the students to share their stories with the rest of the group. Direct the students to return their apples to the table in front of the class. Mix the apples up and ask the students to come back and find their apple. Ask how they knew which apple theirs was (they will indicate things like color, size, shape, special features). Ask what this has to do with people. Make a list of how people are different. Discuss why this is important. Make a list of how people are the same. Discuss why this is important. The lists may be done in cooperative groups and then shared with the large group. Suggest that one way in which all people are similar is that they all have a star inside them (something special that makes them shine, that they especially like about themselves), just like each apple has a star inside it. Cut each apple in half (don’t cut the usual way, but through the center the other way). Let each child see the star inside their apple. While the students eat the apple, allow them to share something about their star, their strengths, their individuality. Some of it can be written on the computer and some of it can be handwritten, with lots of child comments and artwork. 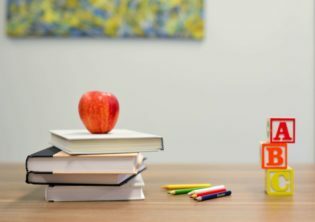 Ask Teachers and Parents to share their favorite Apple goodies. Not only can they read or tell this story, but they can also act it out as a group. After the kids write their story, have them shape the book into an apple. They can share some of their artwork in this book with drawings of apple trees, an apple with a worm, etc. 62. You can see me in the spring. 63. I am an insect. I take nectar from a blossom. I take pollen from one blossom to another. I am yellow and black. I have a top and a bottom. I have apples, cinnamon, and nutmeg inside. I like ice cream on top of me. I stick to a honeybee’s legs. The honeybee takes me from one flower to another. Have you ever had an apple and heard it go “crunch”? Have you ever had an orange, an orange, an orange? Have you ever had an orange and heard it go “slurp”? Have you ever had a banana, a banana, a banana? Have you ever had a banana and heard it go “mush”? One, two, three, four and that is all. Once a little apple seed was planted in the ground. Down came the soft rain, falling all around. Out came the big sun as bright as bright could be. And that little apple seed grew up to be an apple tree. And he likes to play with me. up high in a tree. (Group chant) Who took the apple from the apple tree? “Johnny” took the apple from the apple tree! (Group) Then who took the apple from the apple tree? The child then passes the apple to the next child and play continues until all have had a turn. After everyone has had a turn, have an apple snack and read a favorite apple story. with love and great care. 2500 varieties of apples are grown in the United States and 7500 varieties of apples are grown throughout the world. The most nutritious part of the apple is the skin. Arkansas Black is well named with a deep red, almost black skin. It is rock hard, sweet and tart and a long storage apple. This apple is renowned for its long shelf life. It’s good for making sauce and baking. Braeburn has high impact flavor. The crisp, aromatic Braeburn blends sweetness and tartness just right for snacks and salads. It’s also good for baking, applesauce, and for freezing. Braeburn color varies from greenish-gold with red sections to nearly solid red. Braeburn was discovered as a chance seedling near Nelson, New Zealand in 1952. Its probable parents are Lady Hamilton and Granny Smith. Fuji’s spicy, crisp sweetness and firm flesh make it an excellent fresh eating apple. It’s also good in baking or applesauce and stores well. Fuji flavor improves in storage like fine wine. Fuji skin color varies from yellow-green with red highlights to very red. It was bred from a cross between Red Delicious and Ralls Janet varieties in Japan. Gala is a favorite for fresh eating. It is heart-shaped with distinctive yellow-orange skin with red striping. Gala is just the right size for snacking and is great in salads, good for baking and very good in applesauce. Golden Delicious has firm, white flesh and sweet crisp flavor. 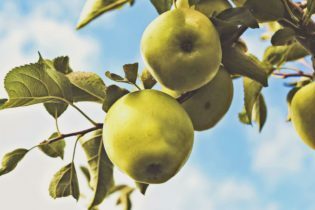 It is the preferred “all purpose” cooking apple since it retains its shape and rich, mellow flavor when baked or cooked. Its skin is so tender and thin that it doesn’t require peeling for most recipes. Golden Delicious is very good in fresh salads and freezes well. Great as a snack or a lunchbox treat. Gravenstein is a terrific sauce and pie apple. It is a roundish, irregularly shaped apple with a very short stem. The color varies but is usually a greenish yellow background covered with broad red stripes. The Gravenstein is crisp, juicy, aromatic and full of old-fashioned tart-sweet flavor. Jonagold is a blend of Jonathan and Golden Delicious apples, offering a unique tangy-sweet flavor with firm flesh. Jonagold is excellent both for eating fresh and for cooking. Jonagold’s make great fried apples. Simply sauté in a little butter and add a little cinnamon. No sugar needed! Mutsu, also called Crispin, is sweet, firm and crisp. It is good for sauce, pies and fresh eating. The Mutsu is a Japanese apple and can be substituted in recipes with the Granny Smith variety if Mutsu is not available in your area. Red Rome apples are referred to as the “baker’s buddy,” this apple was discovered as a chance seedling in the early 1800s on a farm near Rome Township, Ohio. Famed for its storage qualities, this mildly tart apple is primarily used for cooking and is especially good baked or sautéed. The Rome apple is typically available beginning in September. Winesap is the apple with old-fashioned flavor. Winesap has a spicy almost wine-like flavor that makes it the cider maker’s first choice. Violet red in color, it’s great as a snack and in salads. Now that you have all these fun apple crafts and apple themed activities for the kids, you should be on your way to making some great apple-themed art projects and with the apple varieties list, your kids should be able to recognize any apple they stumble across. With the apple bulletin board ideas we’ve provided, you should win the prize for this year’s contest. So, go ahead and sing some apple themed songs and play some apple themed games. When the day is over, you and the kids can enjoy a tasty apple treat!